In order to encourage good hydration, it is important that children have access to water at all times. Having a handy bottle to drink from little and often is the best way to hydrate! Our drinking bottles are great for daily use, field days, school trips or for that special event or sports day. The durable bottles are easy to fill, are non spill, dishwasher safe and have a child friendly mouthpiece. Outcome: Encourages children to keep hydrated. Teaches drinking water as a life skill. Can be branded with your school logo! Simple pricing structure depending on quantity and whether you choose to have your own school logo printed on the bottle. Call us on 01622 834834 or send us an email with your details and the quantity and size of bottles you require. We will send you a quote. 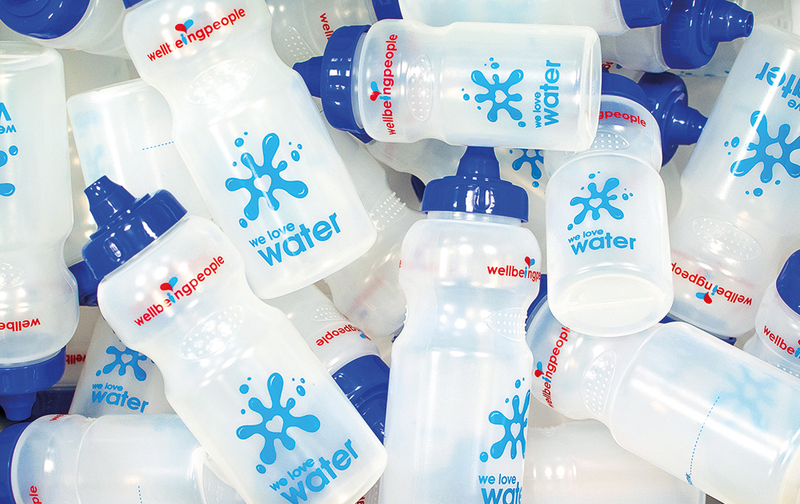 A minimum order of 25 water bottles applies and for branded water bottles, a minimum order of 100. Delivery charges apply. 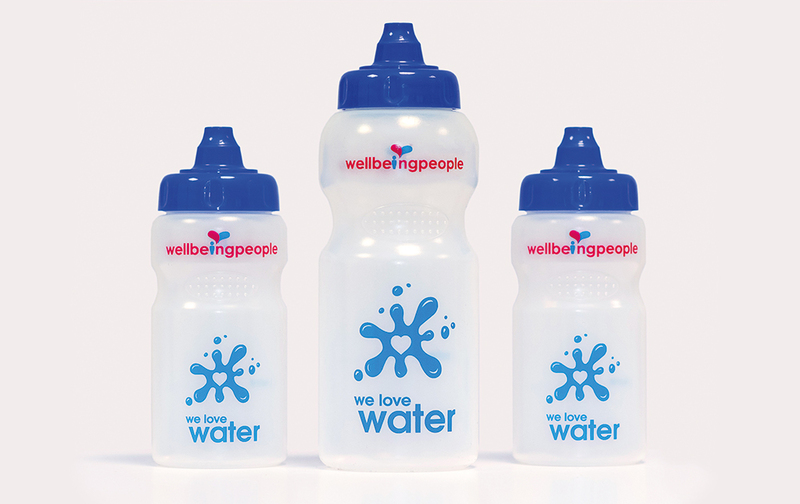 Wellbeing People’s Drinking Water Bottles are durable with a wide neck and easy screw lid making them easy to refill from a tap or water cooler; they are also easy to clean with a brush or safe to put in the dishwasher. The mouth of the bottle is also wide enough to pop ice cubes in for summer months! Our bottles are free of BPA and have been tested to ensure they don’t leak! Whether a nursery, junior or senior school or simply an organisation requiring sports bottles; the ‘We Love Water’ drinking bottles are available to purchase in two sizes, 300ml and 500ml . The 300ml bottles are ideal for small children and are easy for small hands to hold! The 500ml bottles are great for older children and adults. There is space on both sizes of the bottles to add a name. You can personalise your bottles with your school logo or image of your choice. Nice and easy, just send us your school logo or artwork in a high resolution file and we will do the rest. There is a minimum order of 100 bottles for bespoke printing. To order our Schools Drinking Water Bottles, you can email us or just give us a call 01622 834834. We will discuss your requirements with you and email you a quote. Once the order is confirmed, we will arrange delivery. For branded water bottles, a minimum order of 100. If you are a new customer and would like to receive a free bottle sample to see the quality, shape, size etc, then just let us know. Delivery usually takes around 2 working days for non-branded bottles. Branded bottles will take about 3-4 weeks from confirmation of order. Delivery charges are £12 per order.